The British pound fell against the euro after a mixed batch of data on the jobs front. Unemployment increased by 25,000 in the second quarter the Office for National Statistics reported. Average earnings also missed expectations with a 2.4% rise against an expected 2.8%. Analysts blamed the disappointing data on the uncertainty around the general election which fell in the second quarter. On the positive side the headline unemployment rate held steady at 5.6%. The number of advertised vacancies also increased during the period. EUR/GBP rallied one percent as the euro surged higher taking the rate up above 0.7168 for the first time in one month. The move in the euro was propelled by fund flows away from the dollar as the fallout from the massive yuan devaluation continues to send shockwaves around markets. 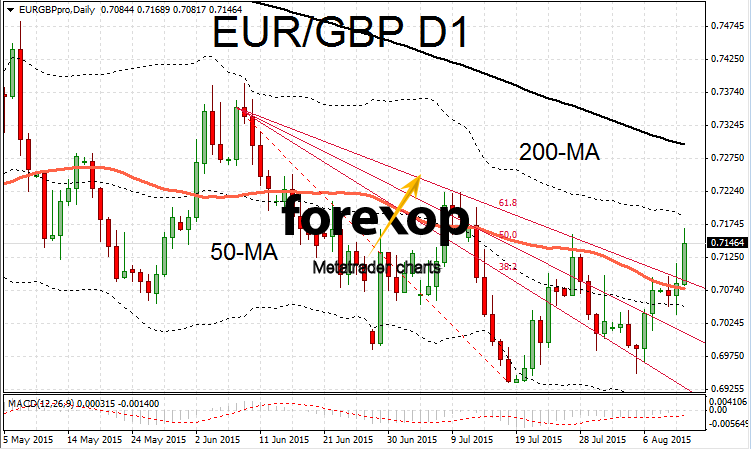 In a bullish move EUR/GBP broke a critical technical resistance (as did EUR/USD) with a move above the 50-day moving average. The level around 0.7080 should now offer support in the event of a drawdown back to the resistance level (which often accompanies strong breakouts). EUR/GBP needs to break resistance around 0.72 in order to establish a new upwards trend and breakout of the downwards channel that’s been entrenched for the past two years. Cable had a choppy session but overall the weaker dollar allowed sterling to win over and move higher. GBP/USD rallied to the middle of the 1.56 band on a strong upwards breakout. Resistance was being met at the top of the 1.55 range but once a break was established the pair rallied up quickly to the middle of the 1.56 area. GBP/JPY saw a down day as investors turned to safe havens such as the yen amid the market turbulence and uncertainty. GBP/JPY dropped to 193.91 shaving over 0.6% off the previous day’s high.